I first saw Mont St. Michel from several miles away across the Bay of St. Michel as our van south from Avranches, France. Its craggy outline of granite rock rose dramatically like a pyramid 558 feet from vast tidal flats in the faint light of dusk, and with rain clouds hovering in the distance the famous silhouette appeared quite misty, definitely mystical. I couldnt take my eyes off of it as we pulled into the Hotel de la Dique, a cozy country hotel and our accommodation for the night. We were to explore Mont St. Michel bright and early the next day before the hoards of tourists arrived to pack the narrow streets leading to the summit. They say at night when darkness sets in over the sea and the Mont's lights are turned on, it glistens like a planet. The picture windows of our inns dining room overlooked it, but I wasnt prepared for the eerie scene that began to unfold before me. Far below, a disappointed photographer walked dejectedly back to the inn when suddenly, as if by some miraculous intervention, the clouds parted and a full moon appeared as the lights came on. He turned on his heels and ran frantically back out to his vantage point for probably the best shot of his life. I awoke to sunlight streaming through my window and couldnt wait to cross the causeway leading to the base of the rock. The early morning sun cast a pinkish glow over the mount with ribbons of pink streaming in all directions. All roads lead north in this northwestern section of France to the two-lane, man-made causeway and the almost 1,300-year-old blockbuster tourist attraction. First, religious pilgrims went there, then invading armies, now tourists. 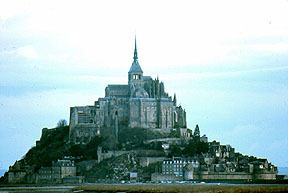 Mont St. Michel came about when St. Aubert a bishop of Avranches, built a chapel on the summit of the island rock after he said St: Michael told him to during a vision in 708. It became a pilgrimage site, and its location and medieval architecture made it a wonder. The structure was enlarged over the centuries, although most of the monastery dates from the 13th century. Eventually, fortifications were added to the rocky pinnacle. Today, the Mont is a "day town," as most visitors arrive by 10:00 A.M. and leave by 3:00 PM. Actually a small town and home to 214 people, Mont St. Michel does offer accommodations, especially for pilgrims. A causeway, which at high tide covers with water, connects the compound of monastery buildings, shops and fortifications to the mainland. Here the tidal bays are the highest in Europe. Many a pilgrim has gotten stuck in the quicksand along the elevated road where the tide changes every several hours. In winter the tides cover the marsh, but during my visit in March they were very low. I entered Porte Bavole, the only entrance in the outer walls of the fortress. Then I passed through the Porte du Roi onto a narrow winding cobblestone lane called La Grande Rue of steps and inclined pathways. Its impossible to avoid the blatant commercialism of the Mont, as souvenir shops and restaurants line both sides of the walkways. Many of the shops developed as pilgrims sought mementoes of their visit. Sometimes they packed away a piece of the rock. Romanesque and Gothic buildings cover the Mont which was attacked many times during the Hundred Years War. Napoleon used it as a prison, and before that it was a retreat for Benedictine monks. No army ever took the Mont, when it was a fortress, and it never suffered damage in any war. Unfortunately, when it was used a: barracks, soldiers took some of the frescos off the walls and sold them. Climbing the 900 steps to the abbey can be strenuous, but there are plenty of shops to wander through and occasional vistas of the French countryside. I stopped for a cup of steaming caf� au lait at Au Vieux Auberge. I paused to sip my coffee on the small patio while taking in a view of the countryside. The apex of the inverted cone-shaped fortress is the spire the 11th century abbey church. The historical museum, open in spring and summer, contains ancient alabaster and paintings on copper. On the way back down I stopped at Omelete Poulard for what had to be the biggest omelet Ive ever hada full 16"long, enough for two people. When I asked how the cook got it so fluffy, the waitress said," We use thirteen eggs and beat them like Hell!"